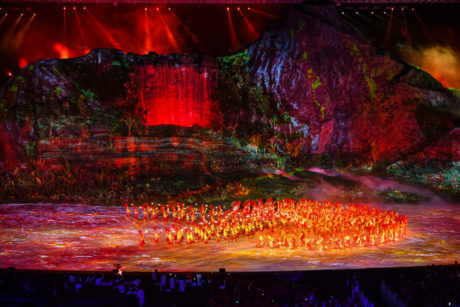 JAKARTA – The 2018 Asian Games Opening Ceremony was a high-energy, animated, colorful spectacular illustrating Indonesia’s origins and rich culture, and sending a strong message of peace and tolerance, staged in Jakarta’s Gelora Bung Karno (GBK) Main Stadium. 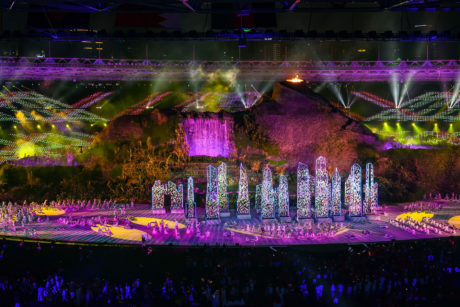 The OC of Asia’s largest sporting event featured a general cast of around 4000, produced by Scott Givens and Libby Hyland working with Indonesian creative director Wishnutama Kusubandio. Staging direction was by Michael Pena working with Indonesian choreographers Denny Malik and Eko Supriyanto, and the breathtakingly visual extravaganza was produced by live event specialists FiveCurrents. 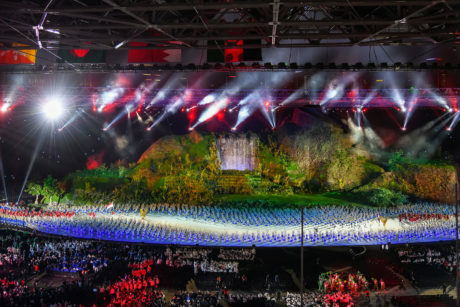 They asked Montreal based lighting designer Yves Aucoin to deliver an impressive lighting design for both Opening and Closing Ceremonies, so Yves specified 270 x Robe BMFLs to be a major part of the lighting rig – a decision on which there was no compromise! “It was BMFLs or BMFLs!” he stated, “They were the only fixture option for a selection of key positions” around the venue. These tough, quality engineered high powered fixtures once again proved their ruggedness and reliability as they performed without a hitch in the sweltering heat and intense humidity. Sixty of the BMFLs – supplied by a number of different companies – were a brand-new purchase by locally based PT Energi Sembilan Perkasa from Jakarta. Yves needed the brightest and most powerful luminaires to deal with the long throw distances and offer the multiple creative features required to light the two-and-a-half-hour action packed OC show, which united traditional and contemporary trends in a four-part theatrical journey. 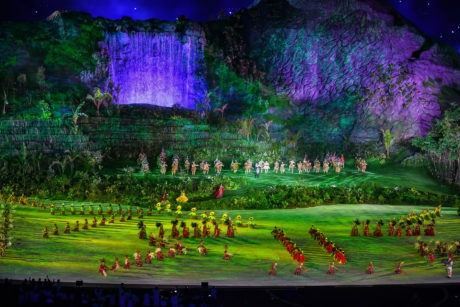 This was inspired by the four elements at the essence of Indonesian spirit – earth, wind, fire and water, and culminated with speeches and the athlete’s parade. Josh Zangan’s epic set design was dominated by imposing rolling green hills and a smoldering volcano, complete with streams, fountains and lush foliage detailing the wonder and magic of nature, surrounded by deep blue seas. This was 350 ft. wide, 96 ft. tall and 80 deep and filled one side of the stadium. The entire set surface was projection mapped together with all the visible field of play. The star-studded artist line-up included some of Indonesia‘s most popular singers and musicians. The OC was also broadcast live nationwide and throughout most of Asia, watched by billions, so the pressure was ON for the production team to deliver something incredible! Yves worked closely with his associate LD Eric Belanger to craft a stunning show to match the occasion, excitement and expectation of everyone watching! The challenges of lighting the OC set and not interfering with any of the projections were galvanizing enough. On top of that, the stadium roof’s weight-loading dictated that no lighting positions were possible on the inner ring; all the overhead equipment had to be concentrated on the outer ring of the roof, where ceremonies lighting contractors PRG painstakingly installed a series of trusses. “Jens Diefenbach, Christoph Hahnl and the PRG team did a fantastic job despite the long hours, heat and humidity” commented Yves. Another layer of lighting was created at the first balcony rail level around the venue … and Yves also utilized plenty of floor lights circumnavigating the field of play. The 270 x BMFLs – comprising 120 x BMFL Spots and 150 x BMFL Blades – were distributed between these three positions and made up just over a quarter of the moving lights used in the show. The total moving light count of 1000 was in turn 25 percent of approximately 4000 fixtures – including some of the stadium’s permanent architectural LEDs – plus a splattering of conventionals, making up the OC production rig! The BMFLs worked hard and constantly throughout the show. Yves made the most of their intensity and flexibility – the smooth color mixing, the excellent zoom and the super-bright output – plus the precise shuttering of the Blades to control light, keeping it focused on the cast – with up to 2000 onstage in some scenes – and off the projection surfaces. “It was vital to be able to highlight the performers properly, whether there were several thousand onstage or just a solo person, and simultaneously, I needed to let the beauty of the set and projection – delivered by 4U2C also from Montreal – shine through. Projection was essential to the narrative and to everyone’s appreciation and enjoyment of the story” he explained. The BMFL Spots were great for adding depth and 3D shaping and texturing to the set without killing the projected imagery, while the Blades were perfect for illuminating cast faces accurately and tightly on the field of play with no spillage. In addition to being excellent tools for all the dramatic requirements, the BMFLs, known for their robust build quality, dealt extremely well with Jarakta’s notorious melting heat and humidity! The show lighting was programmed on a grandMA2 system by Yves and Eric. In addition to Eric Bélanger, two key people on the lighting team were technical manager (systems) Tom Davies, who has worked with Yves before, and production manager (systems) Drika Matheus. “It was a fantastic collaborative process” commented Yves, who loved being in Indonesia for the first time. “As part of the event’s international production I was privileged to work hand-in-hand with a hugely talented and focused local creative team and crew, from their choreographers and costume designers to the lighting and video technicians. Producing this show was a great learning experience for all of us”. He really appreciates the country’s vibrant culture and interesting heritage, and what this, together with the local dynamics, brought to the show. “The energy and vibes I experienced throughout the whole process was so fresh and inspirational” he enthused. Montreal based Yves – also Celine Dion’s long-term LD and touring constantly with the hard-working superstar – was approached by FiveCurrents a year ahead of the Opening Ceremony having been involved with some previous projects. He pitched his initial lighting ideas early in 2018, and the pre-visualization process for lighting gathered pace by April as the show’s storyboard evolved … and following some site visits. The 2018 Asian Games put Indonesia on a world stage for hosting a major sporting event with the whole continent and much of the world watching enrapt. The thrilling OC show went down a storm and is reckoned to be one of the best and most visually exciting Asian Games OCs to date! 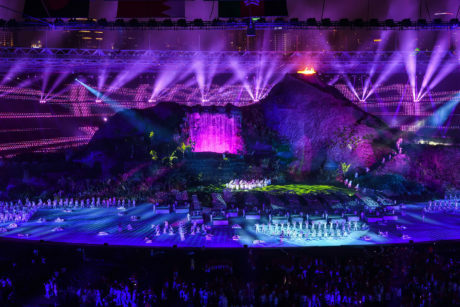 For the Closing Ceremony, Yves and the team were reunited and used almost the same lighting rig, with all the BMFLs and some of the lighting elements shifted around as the Closing format was more of a celebratory pop concert styled event. The 270 x BMFLs in the GBK stadium were not the only Robes on site either in this medal-worthy performance! Fifty-six LEDWash 600s, 80 x BMFLs and 160 x Pointes were deployed across other venues including the Jakarta Convention Centre and the Jakarta International Expo to help light numerous and assorted sporting events. Hailed as one of the most successful Asian Games, 45 nations – including North and South Korea under the united Korean flag – completed part in 465 events covering 40 different sports and disciplines … with 465 medal sets distributed!